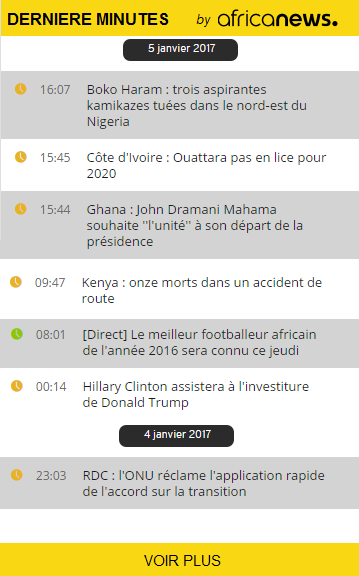 Africanews offers a suite of widgets that enables Africanews content to be quickly and easily embedded into your webpage. Receive free and in real-time all news published by africanews.com, by subscribing to our RSS feeds. How do I subscribe to your RSS feeds? To subscribe, simply click on one of the categories of RSS feeds below. Alternatively, you can copy and paste the URL of the stream of your choice into a standalone aggregator and follow the instructions that will be given. The latest breaking and world news as an embeddable timeline on your website. Keep your visitors informed in real-time of the latest African and World news covering diverse subjects such as economics, politics and diplomacy. How to embed Africanews content? Add Africanews videos to your website. How to add our videos to your site?